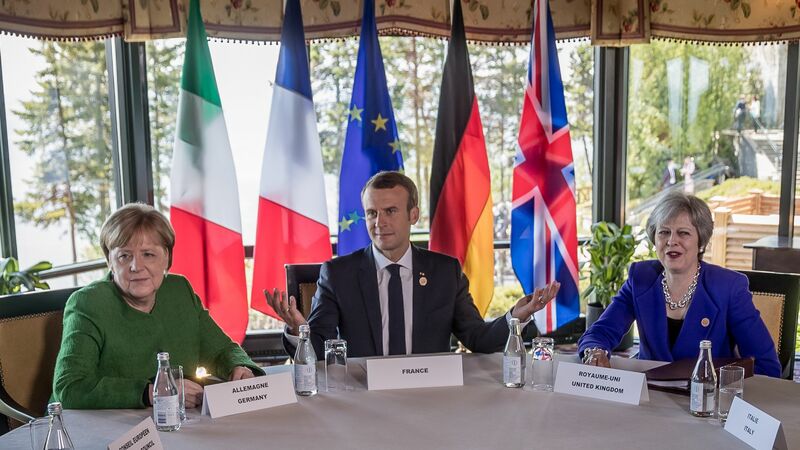 The storm whipping up political chaos across Europe is engulfing the leaders of the continent’s three powers. Germany’s Christian Democratic Union has convened in Hamburg to select a new party leader for the first time since Angela Merkel claimed the post 18 years ago. In London, Theresa May is feeling the sting of defeats inflicted in the parliamentary debate over a Brexit bill that looks all but certain to fail, and likely to doom her premiership. In Paris, Emmanuel Macron has given into a violent rebellion but not yet managed to end it. The bottom line: No one knows what's coming next. 1,001 CDU delegates will elect their, and likely Germany’s, next leader tomorrow after Merkel — who has been chancellor for a remarkable 14 years — agreed to cede the role following a string of electoral embarrassments. France is planning to deploy 89,000 security personnel across the country and close attractions like the Eiffel Tower and Louvre in anticipation of a fourth straight weekend of massive protests — after the first three resulted in hundreds of injuries and four deaths. Vladimir Putin has threatened to begin developing missiles banned under the landmark 1987 Intermediate-Range Nuclear Forces (INF) treaty if the U.S. withdraws from the pact. According to every NATO country and both the Obama and Trump administrations, he already has. Secretary of State Mike Pompeo warned at the NATO foreign ministers summit earlier this week that if Russia does not return to compliance within 60 days, the U.S. will begin the withdrawal process. One case for scrapping the treaty is that the U.S. can't afford to be unilaterally constrained by it as it confronts a growing military threat from China. Why it matters: President Trump tweeted this week about meeting with Russia and China to "halt what has become a major and uncontrollable Arms Race." It seems more likely that the arms race is about to heat up. Of 24 countries polled, only 4 view Russia more favorably than the U.S: (Argentina, Mexico and Germany by a narrow margin; Greece by quite a bit). When it comes to China and the U.S., the world is more divided: 9 countries are more favorable toward China, 13 toward the U.S. and 1 (Spain) split. Worth noting: Much of this is leader-driven. Views of the U.S. have fallen off a cliff in the Trump era, and even most countries that tend to view Russia favorably take a dim view of Putin. Meng Wanzhou, CFO of Chinese telecom giant Huawei (and the daughter of the company's founder), was arrested in Canada in connection with possible violations of U.S. sanctions on Iran. "The arrest will probably not derail the U.S.-China trade talks. China needs the talks to succeed and so while they may become more contentious I will guess they will not stop." "Not that Xi ... needs another reminder of the existential threat that U.S. technological dominance poses, but this case will be used as another rallying point in the increasing efforts to reduce reliance on the U.S., and is just yet another move in the spiraling U.S.-China technology competition." "I will say this again: any foreign and especially U.S. technology firm that has supply chain reliance on China needs to be deep into planning for reducing that reliance, no matter how hard, painful and expensive such a shift would be. Frankly boards of directors of those firms are negligent at this point if they are not pushing the company to do this planning." Israel is negotiating with Hungary's government over the future contents of a new revisionist Holocaust museum to be opened in Budapest, Axios contributor Barak Ravid scoops. Israeli officials told Ravid the nationalist right-wing Hungarian government led by Viktor Orbán wants to use the museum to whitewash any involvement of the Hungarian state or the Hungarian people in Nazi crimes during World War II. Flashback: After Poland passed a controversial law in February making it illegal to attribute crimes committed during the Holocaust to Poland, Israeli Prime Minister Benjamin Netanyahu ended the ensuing diplomatic crisis by cutting a deal with the Polish government and accepting its revisionist narrative. The big picture: This is another example of a populist government in central Europe trying to rewrite the history of World War II and distance themselves from any history of anti-Semitism or cooperation with the Nazis. Netanyahu's government is accommodating those steps because it needs the support of the central European governments — mainly Hungary, Poland and the Czech Republic — inside the EU. "These 'preventive measures' include routine police raids to move migrants from the country's north to the south. ... According to Amnesty International, at least 5,000 people have been 'swept up in the raids' around Morocco, 'piled onto buses and abandoned in remote areas close to the Algerian border or in the south.'" "'Morocco is using these migrants as a pressure card in negotiations with the European Union,'” says Said Tbel, of the Moroccan Human Rights Association. “'It takes them to the border cities to put pressure on Europe. 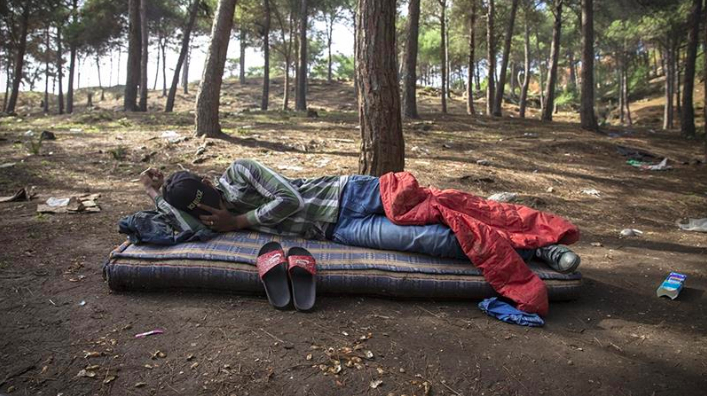 When they get what they want, these migrants are moved back south.'" "'I have been taken to the south 10 times,' a migrant from Ivory Coast, who did not wish to be identified, said at a camp by the main bus station in the port city of Casablanca. 'I was arrested and put in a police car with dogs. From the police station, I was put on a bus with other migrants and taken near the Algerian border. I then had to beg on the streets to make enough money for a bus ride back up.'" "[T]he migrants are forced to sleep on the streets, under bridges or in makeshift shelters until they can collect enough money ... to make their way back up north. They then need to save up enough for a spot on the boat destined for Spain." Meanwhile, in Spain ... Local elections in Andalusia on Sunday gave the fiercely nationalistic and socially conservative Vox party 12 of the provincial assembly’s 105 seats. Vox wants to slash taxes, quash Catalan autonomy, criminalize illegal immigration, build a wall on the Moroccan border, restrict the religious activities of Muslims, and radically centralize political control in Spain. For decades, the brutal legacy of Francisco Franco’s right-wing dictatorship put a stigma on far-right politics. Meanwhile, the center-right Partido Popular (PP) served for many years as a big tent party for the Spanish right, leaving little room for fringier right-wing upstarts. But now, as the number of people with a living memory of Franco dwindles, the stigma is lifting. What’s more, the PP is splintering. What has helped Vox most of all is the surging number of Middle Eastern and African migrants arriving on Spanish shores. 1. "García is probably the last of a dying breed of Latin American politicians — highly educated and well-read, an extremely successful populist, an amazing speaker." "When I interviewed him for my book a couple of years ago, even the journalist who connected us said: 'He is totally corrupt, but if you let him speak for 15 minutes, he will convince you of anything.'" "It was just like that: stories about secret meetings with Fidel Castro and Muammar Ghaddafi in Libya´s desert, conspiracies in Spain with Latin American leaders, etc. As a present, he gave me a book he wrote about 'Confucius and globalization.'" "He was president twice, first as an ultra left winger. He declared Perú wouldn't pay its debts, nationalized banks and left the country in almost the same situation that Venezuela is now before exile in France after Fujimori´s coup. The second period was totally different — pro-market and very against Hugo Chávez [in Venezuela] and the Kirchners [in Argentina]." "This breed of leader is disappearing in the region for more pragmatic, CEO type of politicians with totally different approaches." 2. "I asked some journalist friends why is he being prosecuted now, after decades where everyone knew he was corrupt and did nothing about it. They told me there is a new type of judge in the courts, very influenced by what happened in Brazil with Judge Sergio Moro, that believes is their duty to clean up the country and have no regard for political consequences." "The justice system in Latin America is very interconnected. If this trend starts to permeate other countries, it will be a significant shift in the region, not only for politicians but for foreign companies and businessmen." What to watch: "Remember that Latin America is one of the most corrupt regions in the world, and foreign companies have sort of accepted that in order to do business. If they start to really investigate, many companies can be affected." “I’m going to hold my government accountable for publicly calling me a criminal." — Maria Ressa, a journalist facing trumped up tax evasion charges in the Philippines. Her news organization, Rappler, has been put under severe pressure by Rodrigo Duterte's government. Thanks for stopping by — see you next week!